"There are so many of us out there. Aspiring authors, bloggers (whether established or beginning), industry peeps, even published authors, all of whom want to build their online platforms. We write insightful posts and articles, actively blog within the blogosphere, take part in challenges, competitions, and contests galore. And so, my Writers’ Platform-Building Campaign was born." Sounds like a nice way to meet new friends so I'm going to give it a shot (the Campaign runs from August 22nd to October 31st). If you're an author/blogger who's looking to build your "online platform," maybe you should, too! Hello, fellow fantasy Campaigner! Nice to meet you. Fellow campaigner and new follower! Cheers. I'm a new follower and fellow campaigner. I look forward to getting to know you. Hello I am also doing the campaign. I look forward to getting to know everyone! I joined the Campaign for the same reason. Us lone writers must stick together. This is my first time as a Campaigner so I'm not sure what to expect but it sounds like fun. Thanks everyone! This is great fun and I'm enjoying taking a look at all of your blogs -- quite a bit of interesting reading out there! Hi Roger! I'm a fellow campaigner stopping by to say hi. Hi. Hi. I'm right there with you. Followed the blog. Look forward to your posts and your tweets. Fellow Campaigner stopping by, and new follower! :) It's great to meet you. As a new follower, fellow campaigner, I'm looking forward to reading more from you here. 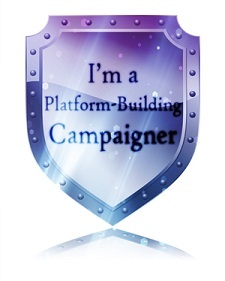 Hi from a first-time campaigner! I'm in the PB-MG-YA group with you. Hi, Roger, fellow Campaigner here. I like the sleek layout of your blog. Hi Roger, I'm your newest follower and fellow campaigner. Just wanted to say hello! Thanks for stopping by to Grillyfish and everyone else who doesn't seem to have a "followers" module on their blog (unless I'm missing something, which is entirely possible). I have been able to follow some of you on Twitter, which is also fun! Hello from the campaign trail! I will be posting a brief intro for fellow campaigners on Thursday. Hi, I'm a fellow campaigner and thought I'd check out the blogs. Hi Roger, Dropped in to say Hi, wait I already did that. Okay, I am a fellow campaigner, who is getting very nervous seeing all this talent out here. Boy have I got work to do. Nice to meet you, and I am looking forward to getting to know everyone. And possibly actually starting on a book of my own. Hi Roger. I'm another campaigner and new follower. I did writing for television a while back. Hello fellow campaigner, nice to meet you. Is it just me or is it hard for people on Blogger to "follow" people on Wordpress? What am I missing? (sigh) It's probably just me. Fellow Campaigner, here! I love that you've dived in to writing and getting your book published. Best of luck with the project! Stopping by to say HEY. Fellow campaigner here. Loving the whole idea of expanding my writer connections. Also gotta say I love the Sinclair Lewis quote. True story. Writers write because we can't stop ourselves. Nice to meet you, fellow fantasy writer. Looking through I see you have a new book nearly ready for release. Congratulations! Hello, fellow fantasy campaigner! Life is getting hectic isn't it. Enjoy your proof stage! Hello from a fellow campaigner. Thanks for stopping by my blog.